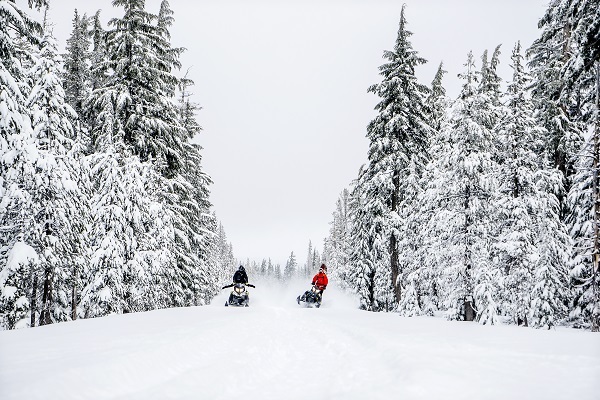 THERE ARE 6,410 MILES OF SNOWMOBILE TRAILS in Oregon winding throughout the Oregon Cascade wilderness toward John Day and up into the northeastern corner of the state. 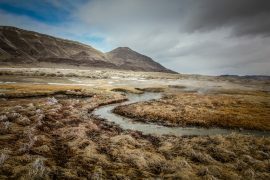 The vast network provides numerous options for day trips and weekend excursions, as well as remote backcountry exploration for those who go from machine to skis or snowshoes. If you’ve been anywhere near a Sno-park on a winter weekend, chances are you’ve seen or heard snowmobilers. They’re another brand of snow enthusiast—spending much of the year looking forward to snowfall and aching for cold, clear days. They live for the thrill of exploring snow-packed forests, getting out away from the crowds and taking in some breathtaking scenery. 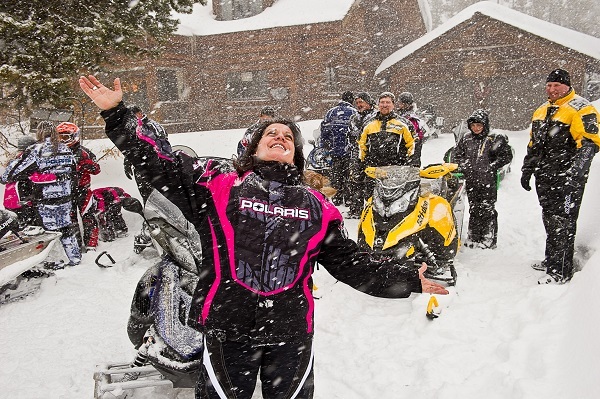 There are many things that enrapture snowmobilers—the access to remote areas, the fast-paced adventure, the community. 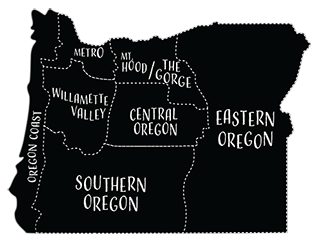 We found folks who represent each of those interests to give you an idea of what snowmobiling in Oregon is all about and what you can do with 6,410 miles. Ralph Tadday is a guy who uses snowmobiles as a means to get out beyond the crowds. He seeks places where his telemark skis might be the first and only skis to carve the fresh powder. Growing up skiing the Harz Mountain Range—the highest mountain range in northern Germany—near his hometown outside of Frankfurt, he developed a love for skiing. He doesn’t consider himself an extreme athlete or even a snowmobiler. The machine is a necessary vehicle to access what he loves to do. Soon after Tadday moved to Bend around 1999, he went skiing with a friend, crossing over to Broken Top from Mt. Bachelor. Once they got there, they skied one run, and they were so tired they headed back and lay on the trail by Todd Lake for almost an hour. 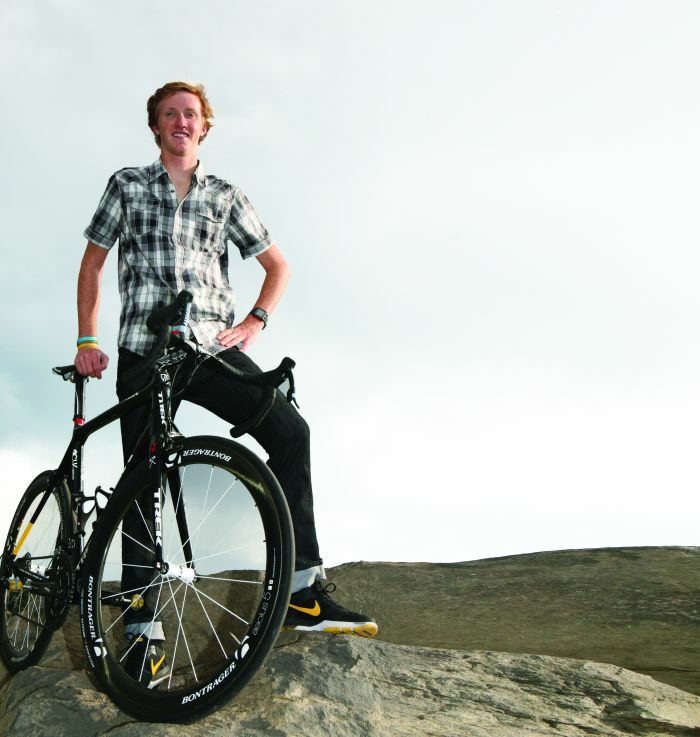 “It was one of the best days,” Tadday said, even though it was such a grueling experience. A week or two later, he bought his first snowmobile. “It’s a pure necessity,” he said. Much like the other snowmobilers we talked to, Tadday appreciates the sport of snowmobiling for its ability to take you where you wouldn’t normally get to go. He doesn’t go out on particularly long excursions because his main goal is to ski. As soon as the conditions are skiable, he’s off the sled and hiking. “Bachelor, as good as it is, it’s a totally different environment,” Tadday said, comparing the popular resort to the pioneering solitude of the backcountry. At any ski resort after a big snow storm, you have to battle for the first run, and you have to be fast. As Tadday has discovered with the help of his snowmobile, you can sit atop South Sisters or Broken Top for an hour and admire the landscape, and you’re still the first. “It’s a very different experience to be out there,” he said. At any ski resort after a big storm, you have to battle for the first run, and you have to be fast. “Some of my earliest memories were on a snowmobile,” C.J. Price said. His grandparents built a cabin on Crescent Lake, and he remembers watching them out on a snowmobile and thinking how fun it looked. The first thing he bought after getting his driver’s license was a snowmobile. A metal fabricator from Elmira, Price, 37, is the president of Crescent Lake’s Walker Rim Snowmobile Club, and a member of the Oregon State Snowmobile Association (OSSA)—an organization dedicated to preserving and enhancing the sport of snowmobiling. It’s the chase for the perfect day and the thrill of the ride that keeps Price passionate about the sport after more than twenty years. There’s a sense of accomplishment he feels when he makes it to a beautiful view after weaving through trees and going in and out of deep snow. He loves the forest in winter: the ice crystals on the snow, the solitude in snow-packed wilderness under a clear, cold night sky. The ideal conditions mean deep powder, cold temperatures, clear skies and probably a stop for good food. 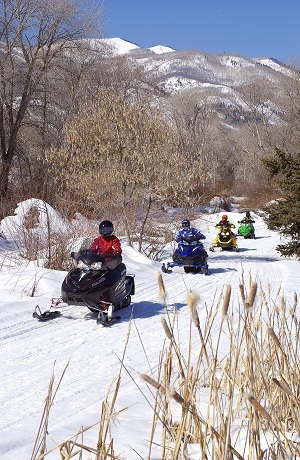 Gather the family or a group of friends and find your perfect snowmobiling basecamp. These lodges across the snowy regions of the state can be a destination in themselves or a jumping off point for accessing miles of snowmobiling trails and backcountry beauty. There are a couple of places—seemingly in the middle of nowhere— that depend on snowmobilers’ and skiers’ business in the winter. Lemolo Lake Resort and Diamond Lake Resort are among Price’s favorite destinations to warm up or for fuel (for his machine and his stomach). Both lodges are off Highway 138 near Crater Lake, offering people a place by the fire, lodging for a weekend basecamp or just a bite to eat. South Shore Pizza near Diamond Lake is accessible only by snowmobile, skis, snowshoes or a Snowcat, and to Price it is the most welcome oasis during a day ride. Diamond Lake Resort offers rustic cabins with more than 500 miles of groomed snowmobile trails out the front door. Because of the distance you can cover on a snowmobile, remote lodges are popular destinations. 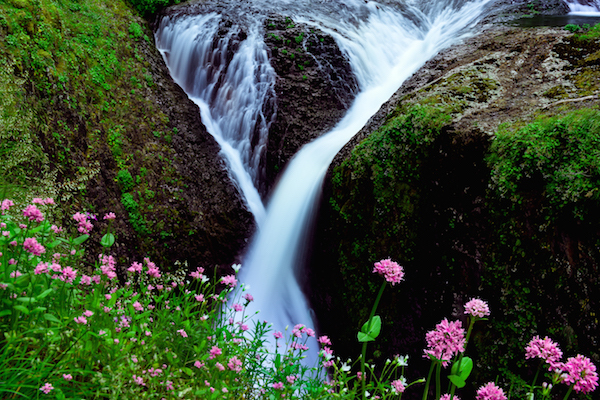 Price has lived his whole life in Oregon, and usually snowmobiles every weekend from October to June, depending on the snowpack. One of his favorite days, an elusive day when everything came together perfectly, happened on a trip to Crater Lake with two friends. They were the only ones out after a heavy snowfall—about a three-foot base and two feet of fresh snow—so it took almost the entire day just to get to Diamond Lake. Days like that make all of the other days and less-than-ideal conditions worth it. For Price, however, a mediocre day snowmobiling is better than a great day not snowmobiling. “I’ve had more of those special moments snowmobiling than anything else I’ve ever done,” he said. Vera Riser, president of the OSSA, and Peggy Spieger, executive director, have been involved with the state organization since the early ’80s. The OSSA is made up of twenty-nine clubs, twenty-two of which are responsible for grooming the 6,410 miles of trails year-round and maintaining warming huts that are open to everyone. Because the trails are on public land—primarily national Forest Service land—they work closely with the Forest Service. The organization provides free snowmobile safety certification classes, and many members are avalanche safety-certified. Each OSSA member is also a volunteer, even Riser and Spieger. The OSSA is made up of twenty-nine clubs, twenty-two of which are responsible for grooming the 6,410 miles of trails year-round and maintaining warming huts that are open to everyone. When Spieger and her husband lived in Eugene, they would ski at Mt. Bachelor. Every once in a while, her husband would hop on a snowmobile with friends, but she didn’t like the idea of snowmobiles—the whole experience seemed frigid. One day in 1979, her husband came home with a snowmobile, so they took it to Crescent Lake to try it out. “Let me tell you, riding on the back with someone else is not the best ride in the world,” Spieger said. The next weekend they had a trailer and two snowmobiles, and, when they moved to La Pine shortly after, they joined the Lodgepole Dodgers, an OSSA club. Her husband became president, which at the time made her the de facto secretary. Riser and her husband got involved soon after and the two became quick friends. “For those of us who would not be able to ski, or participate in a physically active sport, you can snowmobile and still enjoy the outdoors and you can see things that you would not be able to see or experience any other way,” Spieger said. It’s a way for people like Spieger and Riser to get out and explore in the winter, who don’t snowshoe or ski like they once did, but still seek adrenaline like the best explorers. Thank YOU for a great article. 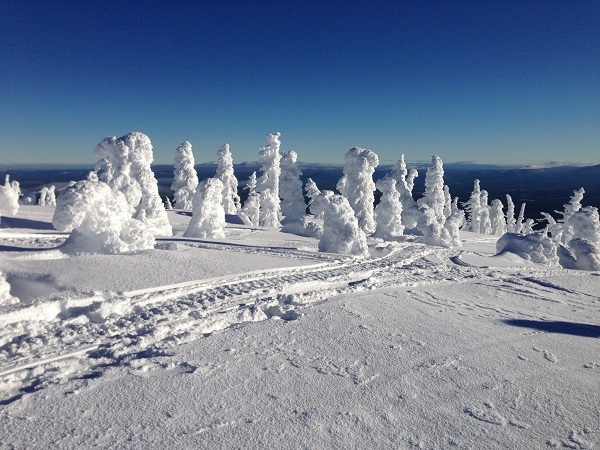 Truly experienced and appreciated are the accomplishments of the snowmobile orangizations and their memberships who do so much for the many, many other outdoor recreationists who appreciate and do enjoy our great Oregon resources.